This has been the pattern of our redesign chats in recent years. 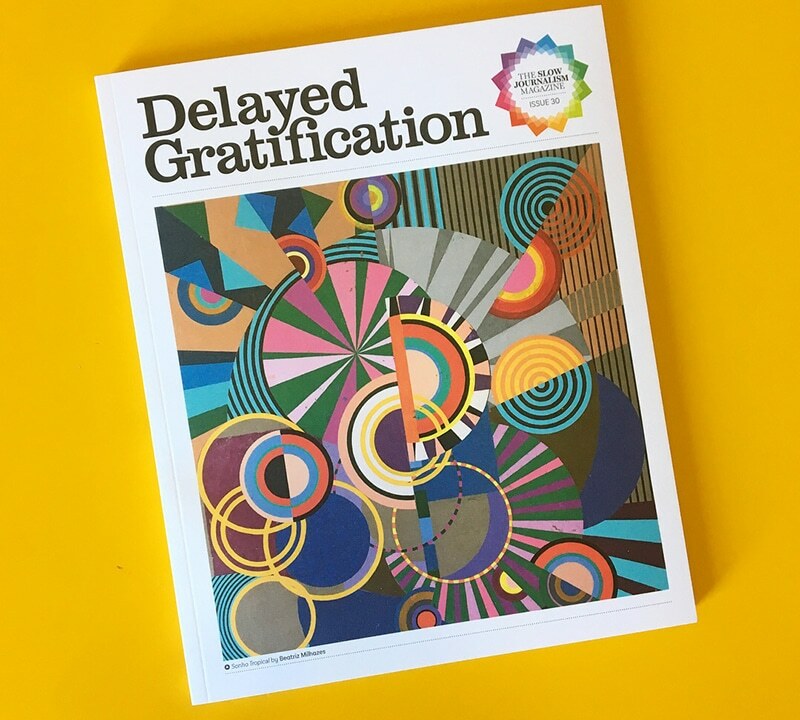 The editorial and design team of DG is a well-meaning and mild-mannered group, but the magazine is our papery baby and the thought of changing it brings us out in a cold sweat. Firstly, we could move the News in Brief write-ups (Nibs), which have always run down the sides of features, into a super new section at the start of each month. Secondly, we could expand the Almanacs sections into new combined sections with Nibs (working title ‘Almanibs’), allowing us to include lots more infographics, including new micro-sized ones (working title ‘Microfographics’), and give readers an overview of the whole month in one place. 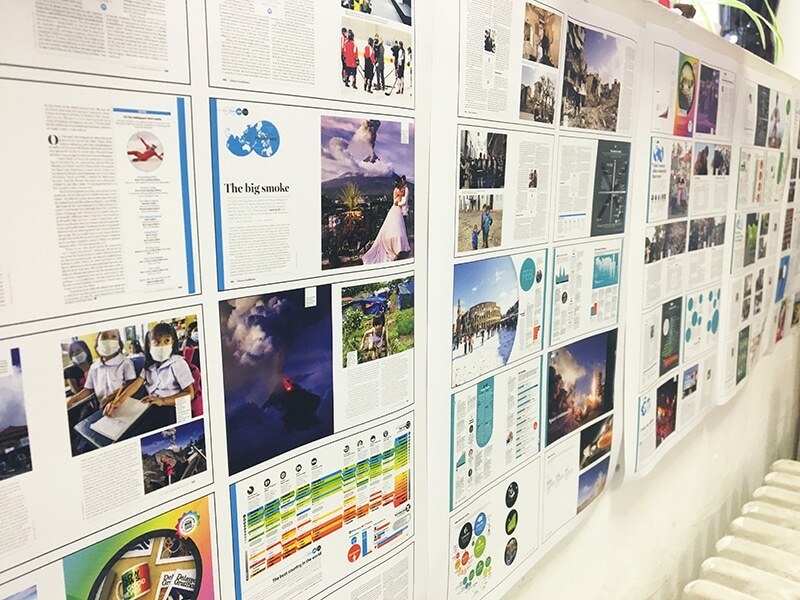 Thirdly, removing the Nibs would free up lots of space in the features for maps, illustrations, information boxes and the occasional double-page spread photo and make the magazine feel more spacious and easier to read. And finally, we could then introduce page numbers to make it simpler for readers to navigate the magazine. Christian’s suggestion produced quite the sensation. It was like the scene inside Wittenberg Castle Church in October 1517 when Martin Luther started lustily nailing his 95 theses to the door. Or when Bake Off moved to Channel 4. There was confusion, incredulity – even a little low-level uproar. Had the announcement taken place during Victorian times, someone would almost certainly have started passing around the smelling salts. Oddly enough, one of the most controversial of Christian’s suggestions was the introduction of page numbers. It’s fair to say that these are a fairly well-established device throughout much of the publishing industry, but when Delayed Gratification was launched back in January 2011 we decided we didn’t need them as with our running Nibs columns we already had dates as a way-finding tag that made specific page numbering redundant. For the next month, the team gathered to discuss Christian’s suggestions in hushed tones, like frightened rabbits tentatively nibbling a carrot they suspect to be a grenade. We talked through the implications of moving Nibs and inserting page numbers, and gradually started to get excited about the editorial benefits. · A new Slow Journalism Company logo surrounded by a pattern made of 12 colours representing the 12 months of the year. This pattern will rotate a quarter turn each issue so the relevant colours for that issue are at the top. · A new sans serif font called Basic Narrow Sans. It’s a clearer and more characterful sans serif which gives us a greater flexibility in weight. It also better complements our main features font, the classic scotch roman newsroom typeface, Miller. · A new ‘In this issue’ contents section, which keeps the ranking of features from long to short and serious to frivolous, but also highlights some of our best stories and allows readers to see the features in chronological order. · A new, cleaner and more beautiful back cover. This was something we agonised over, and a couple of team members fought a rearguard action to keep the existing nest of quotes. But once we saw the new design we were sold: it’s a calmer, less frenetic page and we can still feature our favourite quotes in the new contents section. · A new, harder-wearing but softer-feeling paper stock on the cover, so that copies are less likely to get scuffed. Getting the magazine ready for press was exciting, it felt like the run-up to issue one back in winter of 2010, when everything was new and up for grabs. And getting the first copies of DG#30 back from the press was a particularly pleasing moment. It feels like a big step forward. We’re eager to hear what you think of the new look. We hope you like it, but it may be that you don’t notice a great difference. Or it may be that you do and you don’t approve. Redesigns are funny things and it can take a while to process them. But either way, once you’ve got to grips with the new issue we’d love to hear your thoughts – drop us a line at theeditors@slow-journalism.com. In the meantime, Vive la revolution! And Vivent les page numbers! This entry was posted on Sunday, July 1st, 2018 at 7:24 pm and is filed under From the team, In the mag.